Beyonce Is Now Known As Third Ward Trill. This Is Not A Joke. If you’ve had a chance to listen to Jay-Z‘s polarizing Magna Carta Holy Grail yet, you have probably noticed the distinct vocals of his superstar wife on a number of tracks. Beyonce is the featured artist on “Part II (On The Run)” but can also clearly be heard on album highlights “Tom Ford” and “BBC”. Only she’s credited as Third Ward Trill. Come Again? Well, Third Ward is a part of Houston, while Bey rapped about keeping it ‘trill’ (ie. real) on the chopped-and-screwed buzz single “I Been On”. Is this a new alter-ego à la Sasha Fierce or is Mrs. Carter just playing around with us? I’m not sure but I’m ready for Third Ward Trill to drop a mixtape. 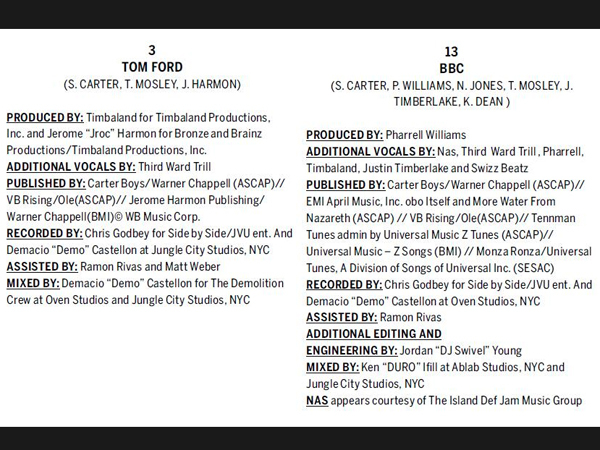 See the Magna Carta Holy Grail‘s album credits after the jump. Do you want to hear more of Beyonce’s rap persona? Let us know in the comments.